ColaLife asks an intriguing question: "Coca-Cola seems to get everywhere in developing countries, yet essential medicines don't. Why?" Coke is highly profitable, so it's developed a huge distribution network to every corner of the planet - a network that can be piggybacked by a clever design to help bring crucial anti-diarrhea medicine to those who need it. ColaLife's Kit Yamoyo is designed to fit in the "negative space" of a Coca-Cola crate, nestling between the bottles without adding any volume to the overall package. This way, it can utilize an existing distribution system to help people at virtually no cost. It's almost enough to make selling sugarwater seem noble! 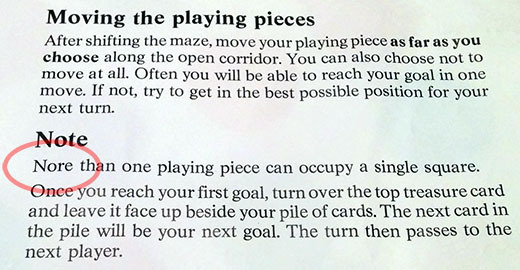 The dreaded "Perfectly Ambiguous Typo"
I was playing a board game the other night (I'm just that cool), when we needed to consult the instructions - and encountered what I'm calling a Perfectly Ambiguous Typo. That's where either of two possible meanings is equally likely, the context provides no clues, and the error could easily have been made either way. Behold: Nore than one playing piece can occupy a single square. It could be "More" or "No more," either meaning is viable, nothing around it suggests one versus other, and it's an easy typo to make from either original text. Fortunately, the problem was averted: the baby decided it was bedtime, so we never finished the game! 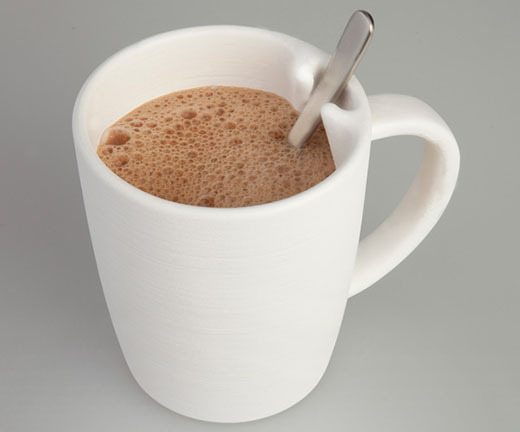 For drinks that need repeated stirring - I'm thinking hot cocoa, but designer Lee Hae Seung Scott's experience is tea or coffee with condensed milk - the required spoon can be a nuisance. When taking a sip, the spoon handle must be held out of the way to keep from banging into your mouth. Scott's NOTA Mug design provides a fix, holding the spoon in a designated spot - which is cleverly aligned with the handle, the one place you'd never try to sip from! It's an elegantly simple fix to a longstanding problem. Venn Diagrams are already beloved by geeks, but I've always thought they deserved to a part of the general conceptual lexicon. 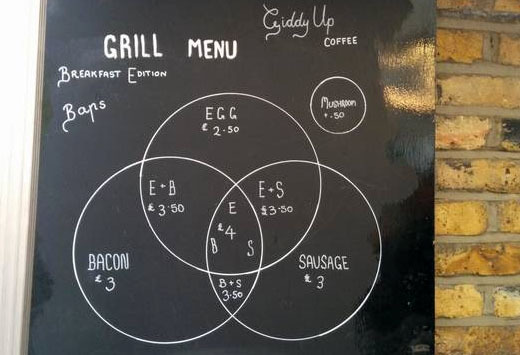 So here's to Giddy Up Coffee in the UK for framing their grill menu as one! The logic is clean, the pricing is understandable, and the food sounds delicious.